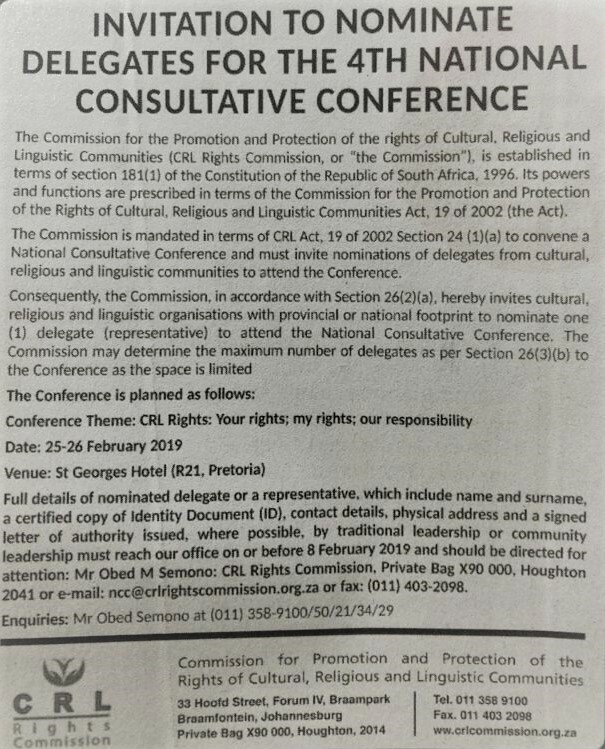 As communicated earlier this week, the CRL Rights Commission (CRL) has called a National Consultative Conference (NCC) in Pretoria on 25 – 26 February 2019. (See the CRL’s notice published in the newspaper on Sunday, 27 January 2019, at the bottom of this message). FOR SA is writing to the CRL to request the agenda for the conference, but we have no doubt that the issue of regulation of religion will be discussed and that the objective is to get “buy-in” from the religious community for a law to be passed, regulating the practising of religion in South Africa. This is probably the most serious threat to religious freedom that the Church in South Africa has faced to date. With a view to further informational and strategic communication in this regard, we would appreciate it if you were to also let us know (at legal@forsa.org.za) if you intend to attend the NCC and/or the Rhema meeting. Please consider supporting FOR SA financially as we are 100% dependent upon donations to enable us to continue to fulfil our mandate to protect and promote our constitutional rights to freedom of religion so that the Gospel can be freely proclaimed and lived out in our daily lives without fear or hindrance. Your financial support is critical for our continued existence! We look forward to continuing to partner with you in this cause!